A unique examination of why the quest for global free trade often forgets that trade liberalization is organized regionally rather than multilaterally. There are now more than 250 regional integration initiatives and this number is steadily increasing. This trend raises a key question: What is the impact of regional integration, both for the countries involved and for those excluded from regional integration schemes? Using a combined economic, political science and scientific approach, this book explores how regional integration can be measured and evaluated and delivers comprehensive answers. 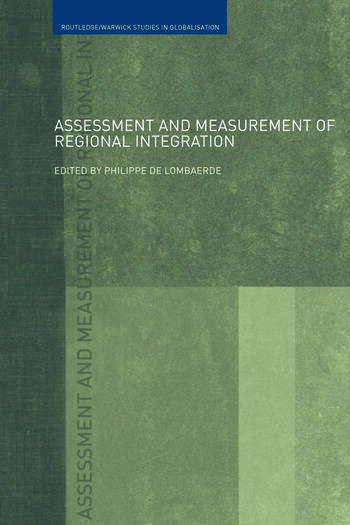 It looks at the methodological problems involved in designing monitoring tools for regional integration in a systematic way and makes a number of concrete suggestions for designing and organising systems of indicators of regional integration. It also offers a critical overview of available indicators and tools and presents crucial new monitoring instruments. This book will be of great interest to students and researchers of international relations and economics as well as policy makers and professionals within international and regional organizations. Philippe De Lombaerde is an economist and a Research Fellow at the United Nations University-Comparative Regional Integration Studies (UNU-CRIS) in Bruges, Belgium.